A cemetery is a place in which dead human bodies and cremated remains are buried, usually with some form of marker to establish their identity. The term originates from the Greek κοιμητήριον, meaning sleeping place, and can include any large park or burial ground specifically intended for the deposit of the dead. Cemeteries in the Western world are also typically the place where the final ceremonies of death are observed, according to cultural practice or religious belief. Cemeteries are distinguished from other burial grounds by their location and are not usually adjoined to a church, as opposed to a "graveyard" which is located in a "churchyard," which includes any patch of land on church grounds. 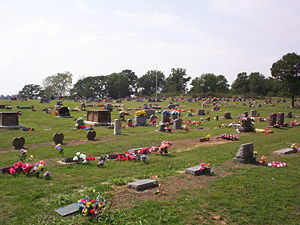 A public cemetery is made open for use by a surrounding community; a private cemetery is used only by a portion of the population or by a specific family group. A cemetery is generally a place of respect for the dead where the friends, descendants, and interested members of the public may visit to remember and honor those buried there. For many, it is also a place of spiritual significance, where the dead may visit from the afterlife, at least on occasion. The grave of an infant at Horton, Northants. The term cemetery was first used by early Christians and referred to a place for the Christian burial of the dead, often in Roman catacombs. The earliest cemetery sites can been traced back to the fifteenth century and have been found throughout Europe, Asia, and North America in Paleolithic caves and fields of prehistoric grave mounds, or barrows. Ancient Middle Eastern practices often involved the construction of graves grouped around religious temples and sanctuaries, while early Greek practices buried the dead along the roads leading to their cities. Early burial grounds consisted of earthen graves, and were often unsightly and hasty places to dispose of the dead. European burial was customarily under the control of the church and took place on consecrated church ground. Though practices varied, in continental Europe, most bodies were buried in a mass grave until they had decomposed. The bones were then exhumed and stored in ossuaries either along the arcaded bounding walls of a cemetery or within the church, under floor slabs and behind walls. The majority of fifteenth century Christian burial grounds became overcrowded and consequently unhealthy. The first Christian examples of cemeteries outside of a churchyard were founded by Protestants in response to overcrowded churchyards and the desire to physically and spiritually separate the dead from the living, a concept often intertwined with the Roman Catholic faith. Early cemetery establishments include Kassel (1526), Marburg (1530), Geneva (1536), and Edinburgh (1562). The structure of early individual grave sites often reflected the social class of the dead. The formation of modern cemetery structures began in seventeenth century India when Europeans began burying their dead in cemetery structures and erecting vast monuments over the graves. Early examples have been found in Surat and Calcutta. In 1767, work on Calcutta’s South Park Street Cemetery was completed and included an intricate necropolis, or city of the dead, with streets of mausolea and magnificent monuments. In the 1780s and 1790s similar examples were to be found in Paris, Vienna, Berlin, Dessau, and Belfast. The European elite often constructed chamber tombs within cemeteries for the stacking of family coffins. Some cemeteries also constructed a general receiving tomb for the temporary storage of bodies awaiting burial. In the early 1800s, European cities faced major structural reforms that included the restructuring of burial grounds. In 1804, for hygienic reasons, French authorities demanded that all public cemeteries be established outside city limits. Entrusted with a project to bury the dead in a way that was both respectful and hygienic, French architect Alexandre Brogniart designed a cemetery structure that included an English landscape-garden. The result, Mont-Louis Cemetery, would become world famous. In 1829, similar work was completed on St. James Cemetery in Liverpool, designed to occupy a former quarry. In 1832 Glasgow’s Necropolis would follow. After the arrival of cholera in 1831, London was also forced to establish its first garden cemeteries, constructing Kensal Green in 1833, Norwood in 1837, Brompton in 1840, and Abney Park in 1840, all of which were meticulously landscaped and adorned with intricate architecture. Italian cemeteries followed a different design, incorporating a campo santo style which proved larger than medieval prototypes. Examples include Certosa at Bologna, designed in 1815, Brescia, designed in 1849, Verona, designed in 1828, and the Staglieno of Genoa, designed in 1851 and incorporating neoclassical galleries and an extensive rotunda. Over time, all major European cities were equipped with at least one reputable cemetery. In larger and more cosmopolitan areas, such cemeteries included great architecture. U.S. cemeteries of similar structure included Boston’s Mount Auburn Cemetery, designed in 1831, Phildelphia’s Laurel Hill Cemetery, designed in 1839, and New York City’s Green-wood Cemetery, designed in 1838. Many southern U.S. cemeteries, such as those in New Orleans, favored above ground tomb structures due to strong French influence. In 1855, architect Andrew Downing suggested that cemetery monuments be constructed in such a way as to not interfere with cemetery maintenance; with this, the first "lawn cemetery" was constructed in Cincinnati, Ohio, a burial park equipped with memorial plaques installed flush with the cemetery ground. Arlington National Cemetery, Washington D.C.
American military cemeteries developed out of the duty of commanders to care for their comrades, including those that had fallen. When the casualties of the American Civil War reached incomprehensible numbers, and hospitals and burial grounds overflowed with the bodies of the dead. General Montgomery Meigs proposed that more than 200 acres be taken from the estate of General Robert E. Lee for the purpose of burying the causalities of war. What followed was the development of Arlington National Cemetery, the first and most prestigious of war cemeteries to be erected on American soil. Today Arlington National Cemetery houses the bodies of those who died as active-duty members of the Armed forces, veterans retired from active military service, Presidents or former President of the United States, and any former member of the armed services who received a Medal of Honor, Distinguished Service Cross, Silver Star, or Purple Heart. 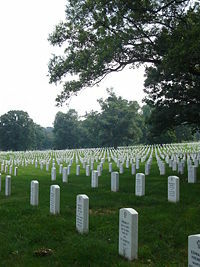 Other American military cemeteries include the Abraham Lincoln National Cemetery, the Gettysburg National Cemetery, the Knoxville National Cemetery and the Richmond National Cemetery. Internationally, military cemeteries include the Woodlands Cemetery near Stockholm (1917), the Slovene National Cemetery in Zale (1937), the San Cataldo Cemetery in Modena (1971), and the Cemetery for the Unknown in Hiroshima, Japan (2001). The change in cemetery structure sought to re-establish the "rest in peace" principle. Such aesthetic cemetery design contributed to the rise of professional landscape architects and inspired the making of grand public parks. At the turn of twentieth century, cremation offered a more popular, though in some places, controversial option to casket burial. A "green burial" ground or "natural burial" ground is a type of cemetery which places a corpse into the soil to naturally decompose. The first of such cemeteries was created in 1993 at the Carlisle Cemetery in the United Kingdom. The corpse is prepared without traditional preservatives, and is buried in a biodegradable casket or cloth shroud. The graves of green burials are often minimally marked as to not interfere with the landscape of the cemetery. Some green cemeteries use natural markers such as shrubs or trees to denote a grave site. Green burials are posed as an environmentally friendly alternative to customary funeral practices. Internationally, the style of cemeteries has varied greatly. In the United States and many European countries, cemeteries may use tombstones placed in open spaces. In Russia, tombstones are usually placed in small fenced family lots. This was once a common practice in American cemeteries, and such fenced family plots can still be seen in some of the earliest American cemeteries constructed. 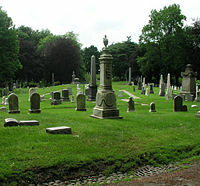 Cemeteries are not governed by laws that apply to real property, although most states have established laws that specifically apply to cemetery structures. Some common regulations require that each grave must be set apart, marked, and distinguished. Cemetery regulations are often required by departments of public health and welfare, and may prohibit future burials in existing cemeteries, enlargement of existing cemeteries, or the establishment of new ones. 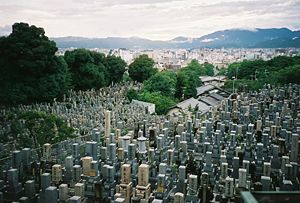 Cemeteries in cities use valuable urban space, which may pose a significant problem within older cities. As historic cemeteries begin to reach their capacity for full burials, alternative memorialization, such as collective memorials for cremated individuals, became more common. Different cultures have different attitudes toward the destruction of cemeteries and subsequent use of the land for construction. In some countries it is considered normal to destroy the graves, while in others the graves are traditionally respected for a century or more. In many cases, after a suitable period of time has elapsed, the headstones are removed and the cemetery can be converted into a recreational park or construction site. Trespassing against, vandalizing, or destruction of a cemetery or individual burial plot are considered criminal offenses, and can be prosecuted by the heirs of the involved plot. Large punitive damages, intended to deter further acts of desecration, may be awarded. A Buddhist graveyard. Kyoto, Japan. In many cultures, the family is expected to provide the "final resting place" for their dead. Biblical accounts describe land owned by various important families for the burial of deceased family members. In Asian cultures, regarding their ancestors as having spirits who should be honored, families carefully selected the location for burial so as to keep their ancestors happy. While uncommon today, family or private cemeteries were a matter of practicality during the settlement of America. If a municipal or religious cemetery was not established, settlers would seek out a small plot of land, often in wooded areas bordering their fields, to begin a family plot. Sometimes, several families would arrange to bury their dead together. While some of these sites later grew into true cemeteries, many were forgotten after a family moved away or died out. Groupings of tombstones, ranging from a few to a dozen or more, have on occasion been discovered on undeveloped land. Usually, little effort is made to remove remains when developing, as they may be hundreds of years old; as a result, the tombstones are often simply removed. More recent is the practice of families with large estates choosing to create private cemeteries in the form of burial sites, monuments, crypts, or mausolea on their property; the mausoleum at architect Frank Lloyd Wright's Fallingwater is an example of this practice. Burial of a body at such a site may protect the location from redevelopment, such estates often being placed in the care of a trust or foundation. State regulations have made it increasingly difficult to start private cemeteries; many require a plan to care for the site in perpetuity. Private cemeteries are nearly always forbidden on incorporated residential zones. Since their eighteenth century reform, various cemeteries worldwide have served as international memorials, renowned for their meticulous landscaping and beautiful architecture. In addition to Arlington National Cemetery, other American masterpieces include Wilmington National Cemetery, Alexandria National Cemetery and the Gettysburg National Cemetery, a military park offering historic battlefield walks, living history tours, and an extensive visitor center. 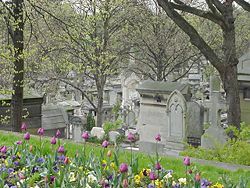 Parisian cemeteries of great renown include the Père Lachaise, the world’s most visited cemetery. This cemetery was established by Napoleon in 1804, and houses the graves of Oscar Wilde, Richard Wright, Jim Morrison, and Auguste Comte among others. Paris is also home to the French Pantheon, completed in 1789. At the start of the French Revolution, the building was changed from a church into a mausoleum to hold the remains of noteworthy Frenchmen. The pantheon includes the graves of Jean Monnet, Victor Hugo, Alexandre Dumas, and Marie Curie. London’s Abney Park, opened in 1840, is also an international place of interest. One of London’s seven magnificent cemeteries, it is based on the design of Arlington National Cemetery. The remaining magnificent seven include Kensal Green Cemetery, West Norwood Cemetery, Highgate cemetery, Nunhead Cemetery, Brompton Cemetery, and the Tower Hamlets Cemetery. England’s Brookwood Cemetery, also known as the London Necropolis, is also a cemetery of note. Established in 1852, it once was the largest cemetery in the world. Today more than 240,000 people have been buried there, including Margaret, Duchess of Argyll, John Singer Sargent, and Dodi Al-Fayed. The cemetery also includes the largest military cemetery in the United Kingdom. The ancient Egyptian Great Pyramid of Giza, marking the tomb of Egyptian Pharaoh Khufu, is also a well-known tourist attraction. Encyclopedia of U.S. History. Cemeteries. U.S. History Encyclopedia. Retrieved June 4, 2007. Etlin, Richard A. 1984. The Architecture of Death. Cambridge, MA: MIT Press. Gale, Thomas. Cemeteries. Thomas Gale Law Encyclopedia. Retrieved June 4, 2007. Oxford University Press. Cemetery. Dictionary of Architecture and Landscape Architecture. Retrieved June 4, 2007. All links retrieved January 23, 2017. London Cemetery Project: 130 cemeteries with high-quality photos. This page was last modified on 23 January 2017, at 19:55.